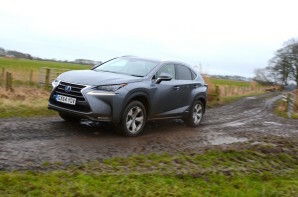 The NX is Lexus’s interpretation of the perfect crossover, and that means hybrid power, electric four-wheel drive and a reassuringly large price tag. The key technical elements of the NX will be familiar to Toyota/Lexus hybrid owners, with a petrol engine (2.4-litre) combining with an electric motor to drive the front wheels through a CVT gearbox. In common with the well-established RX, the rear wheels are driven by a second electric motor which allows four-wheel drive. Driving the rear wheels electrically provides a couple of big advantages; the lack of a drive shaft liberates more interior space, and cuts weight. However it does mean that all of the torque produced by the petrol engine and the front motor have to be dealt with by the front wheels alone, something that doesn’t hinder mechanical four-wheel drive systems. The hybrid system may be familiar but the NX showcases Lexus’s new found confidence in the styling department. Externally the NX is striking, with angular features and pronounced wheel arches producing a bold and distinctive look. The interior is both beautifully finished and curiously dated at the same time, but it does meet the ‘premium’ tag. The NX achieves excellent official fuel economy with resultant tax benefits. It is also very well finished and distinctively styled. The hybrid system remains a mixed bag delivering those fuel economy figures but also denting performance and refinement largely as a result of the much-unloved CVT gearbox. It is however capable of towing 1500 kg and can swallow 475 litres of luggage so there is some substance behind the attention-grabbing looks.